The long distance runner. A durable carbon black mixture, a well regarded puncture protection system and the DuraSkin™-anti-cut fabric turn the GatorSkin into a real long distance runner. In varying widths of 23mm and 25mm it can be used on the way to work as well as training for road races or for sportives and audax. A durable, tough tire at a really nice price. AMAZING BY DESIGN – The reptilian design sets the tone for eating up those miles! 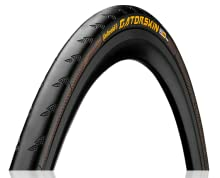 The Continental Gatorskin is the ultimate training & racing tire where puncture protection is a priority. Using the latest proprietary technology against flats the Gatorskin range uses PolyX Breaker and DuraSkin sidewall protection. The Gatorskin tire is made for the long haul. Backed by PolyX Breaker, a tried and true puncture protections system and the DuraSkin anti-cut fabric turn the Gatorskin into a true long distance runner. Tires with DuraSkin sidewall protection have to be able to roll with the punches. They are used under the harshest conditions. On messenger bikes, the tires skid along curbs; on touring bikes, they cross continents without wearing out. During races, they have to endure tough tests such as the Paris-Roubaix. The high-quality polyamide fabric protects the tire casing against the worst conditions. These tires stand out thanks to their signature brown sidewalls. Continental’s PolyX Breaker brings their car expertise to the bicycle tire segment. Polyester has been used successfully for years in Continental’s car tires and been tried and tested many times. The extremely resistant polyester fiber is woven tightly crosswise. In this way, a very high fabric density is reached which not only makes the Breaker more resistant to foreign objects but is also especially resistant to punctures. This protection is accomplished without affecting rolling resistance. The ever popular, tried and true Gatorskin is available in wire bead and folding versions that span a wide variety of tire sizes. Designed for commuting, touring, or heavy training – the Gatorskin will not let you down. Reviews don’t lie. 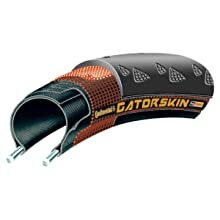 With 1000’s of online reviews here on Amazon and other cycling forums across the web, the Gatorskin is consistently the highest rated and bestselling bike tire. Often imitated, but never duplicated, this legend will live on forever. 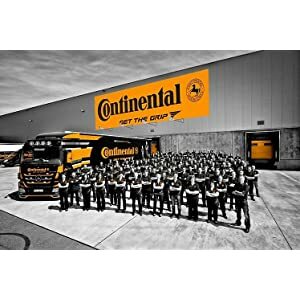 Inside Continental’s technology and development center in Korbach, they are constantly developing new revolutionary technologies such as the unbeatable Black Chili compound and the ultimate Vectran breaker anti-puncture technology, both used at the top end of race sport. These technologies demand sophisticated processes to ensure our legendary end-product quality, and these innovations as well as the ProTection and RaceSport technology for MTB tires, can only be manufactured in our factory in Germany – ‘Handmade in Germany’.